Third release by this fine composer (debut was “Great Wall of Sound” 2006 and sophomore was “Movements” 2008) and his most realized to date. All instrumental (except a poem read in ‘Galen’, track 10 and this will pass you by quickly if you are paying attention) recording rich with many styles but cinematic in scope and atmosphere. 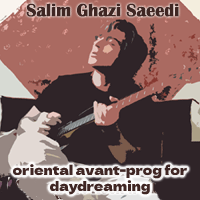 You’ll find big Middle Eastern influences along with jazz fusion, classical, progressive rock, ambient, and more. You can imagine a blend of Mike Oldfield, Jean Luc Ponty, and Darryl Way (early solo). Remarkable disc by ever-loving, everlasting and ever so fantastic classical progressive rock band that has often stunned listeners since the godhead days of 1976 (In the Region of Summer Stars) and 1976 (Aerie Faerie Nonsense). The present line-up of The Enid is Joe Payne (vocals, EWI). Robert John Godfrey – the foundation, rock, and visionary of the band throughout its time (keyboard and orchestration). Max Read (guitar, vocals and choirs, EWI, programming), Jason Ducker (guitar), Dominic Tofield (drums), and Dave Storey (drums on “Mayday Galliard”). One half of Duex Accords Piront (she has also played with Knopf Quartet and La Rosa Enflorese), Anne is not a newbie when it comes to solos or inventive music. It seems to just come natural to this empirical diatonique accordion composer, player, performer, and arranger from Belgium. The cover art shows her pacing through the streets of some familiar neighborhood looking to the skies as she plays her accordion. It’s a tiny slice of the journey she outlines in the nice digipak inner notes as to the concept of her brilliant new recording, “Musette Is Not Dead”. Be prepared to be blown away with this spectacular two disc live release by the absolutely one of a kind Mary Fahl (formerly of October Project). With full back up band, you are gifted with a generous selection of her solo works, as well as powerful classics from October Project. You’ll never forget this gem of a release.